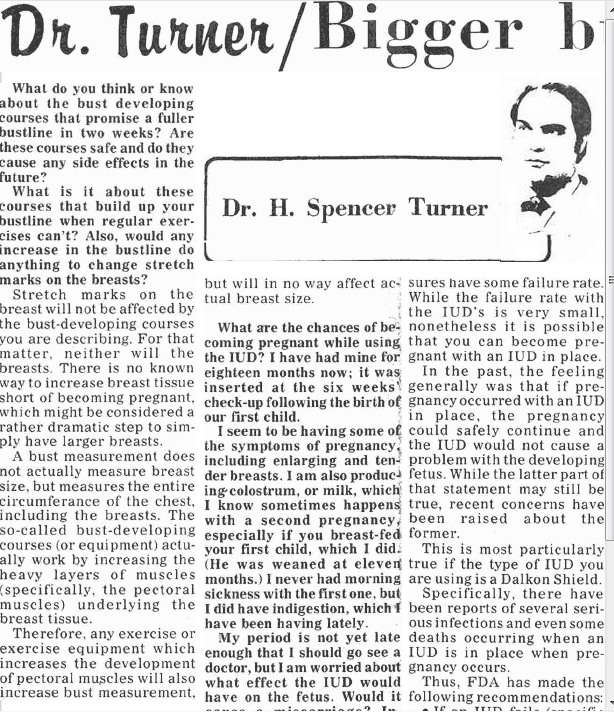 Dr. Turner received a question on bust developing courses in 1975. The question asked if they are safe and do they cause any side effects in the future. While I personally have not received such questions, a quick search on Google shows that this is still a very popular topic. 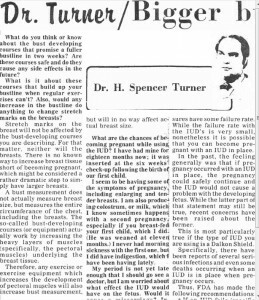 It is possible, with exercise, to increase your bust measurement, but as Dr. Turner indicated this measurement does not actually measure the size of your breasts, but rather the circumference of the chest. The breasts themselves do not contain any supportive muscle tissue. Therefore it is not possible, through exercise to increase your cup size. What exercise can do, however, is develop the muscles behind your breasts to make them more attractive. The original article can be read in the Lantern Archives. Posted in about us, exercise, sexual health, womens health	Bookmark the permalink.